The Lilac and Sage Tote Bag is perfect for carrying around any number of things. Use it at the beach, at the park, or in the living room to keep your stash contained. 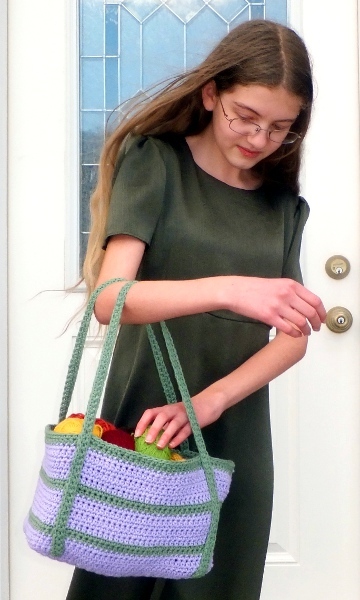 Crocheted in a sturdy cotton yarn, it works up quickly and is fairly simple. The base is worked flat, after which stitches are crocheted around the edges of the base and worked in the round up to form sides. The handles are worked separately and sewn on. 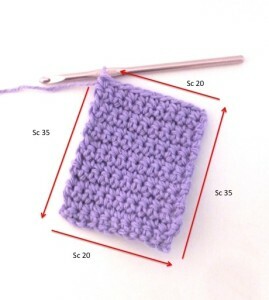 Gauge: 13.5 sts/16rows = 4″/10cm in sc. NOTE: When working in the round, work in a continuous spiral without joining rounds. A stitch marker may be useful for keeping track of rounds. Rows 2-35: Ch 1, skip 1 ch, sc across, turn. Row 36: Ch 1, skip 1 ch, sc across. Do not turn work, but continue on to sides of bag. You will now work sc all the way around the edges of the base as follows: Hold base so that working stitch is at upper left corner. Turn base 90 degrees clockwise and sc 35 sts along left edge of base, turn base 90 degrees clockwise and sc 20 sts along bottom edge of base, turn base 90 degrees clockwise and sc 35 sts along right edge of base, turn base 90 degrees clockwise and sc 20 sts along top edge of base (110 sts). You will now continue to work these sts in the round to form sides as follows. Rnd 1: Hdc in each st around. Rnd 2: Sc in each staround. Rnds 3-4: Repeat Rnds 1-2, changing to CC in last loop of last st.
Rnds 5-6: Repeat Rnds 1-2, changing to MC is last loop of last st.
Rnds 7-12: Repeat Rnds 1-2 three times, changing to CC in last loop of last st.
Rnds 13-20: Repeat Rnds 5-12. Rnds 21-22: Repeat Rnds 1-2, sl st in first st of rnd, fasten off. Row 2: Ch 1, skip 1 ch, sc across, fasten off. Finishing: Sew handles down sides of bag at corners. Weave in ends. About the Designer Sarah Gomez is a young Christian crochet (and knitting) designer who lives near Pittsburgh, Pennsylvania. 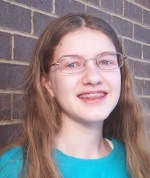 Besides crochet and knitting, she enjoys spinning, reading fantasy books, and going crazy over all the beautiful yarns at her LYSs. You can find more of her work at her website, www.alittlebittoknit.com, and on Ravelry as aLittleBitToKnit. Pattern & images © Sarah Gomez. All rights reserved. This looks like the perfect bag to take to the beach! I cna see me making several of these over the next few months. This looks like the perfect bag to take to the beach! I can see me making several of these over the next few months. How beautiful, attractive, and multi-faceted! Love it! I had written – How beautiful, attractive, and multifaceted! Love it! ….. But with the ugly face my comment provoked, I will amend the comment with the explanation that Sarah is our granddaughter and Patti our daughter, who married a wonderful Gomez, and even though I can’t knit, crochet, or sew for anything, we are very proud of Sarah. And yes, she loves every bit of the knitting, crocheting and designing she does!